Surgical Services: Our modern surgical suite provides for the performance of a wide variety of surgical procedures. Types of surgeries that we have performed at our facility include, elective spays and neuters, plating and pinning of broken bones, cruciate ligament repairs, diagnostic laparoscopy, as well as emergency cesarean sections, and various other surgeries. Dentistry: Our dental services include routine teeth cleaning and polishing, tooth extractions and minor oral surgery. 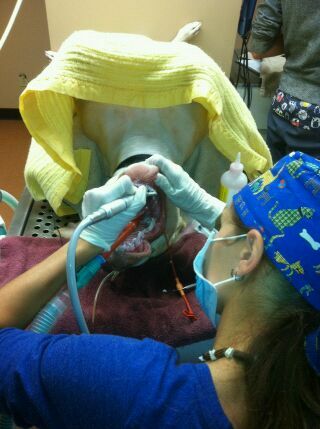 All pets must be put under general anesthesia to perform a proper dentistry. We use ultrasonic scaling to clean your pet's teeth, this is very similar to the machine your dental hygienist uses. We do strongly recommend brushing your pet's teeth on a routine basis, so as to prevent severe tartar build-up and/or gingivitis. Some pets may not need their teeth professionally cleaned annually but as part of an annual physical exam, our veterinarians will examine your pet's mouth for any symptoms of dental disease. Anesthesia: We utilize isoflurane as our inhalant to maintain our patients under general anesthesia. Your pets' anesthesia will be montiored by a licensed Veterinary Technologist using a modern ECG, SPO2, blood pressure and respiration combination Vetspecs unit. After 7 years of age, our pets are considered geriatric, and we REQUIRE a pre-anesthestic bloodwork panel to be completed prior to any anesthetic procedure. The veterinarian will interpret this bloodwork which itself evaluates the functions of the liver, kidney and other organs. You may ask for this bloodwork to be completed whenever your pet is going in for surgery.